I have a mimic panel which does exactly that for some of my points Kevin - the points I'm operating with servos via the Megapoints system. It works very well but there's quite a lot of wiring involved. I'll take some photos of it later tonight if I get a chance. Couldn't you just have a "check list" to work your way through ? 1. Set point No 1 "on"
2. Set point No 2 "off"
3. Set point No 3 "on"
It should be easy enough to incorporate a SPDT slide switch with 2 LEDs (red/green) that is activated by the movement of the wire. Hi Nigel. Thank you for your reply. I would agree with that idea , if I was using " Bicycle spokes" or a similar solid wire like the coat hangers from the Dry Cleaners. But the wire that I am using is like Music Wire.Being that I am using DPDT slide switches , I have been trying to figure out how I could utilise the three spare pins on each switch. It would probably require a separate supply, a common return and , that's the part I'm not sure of. I used these for my mimic panel Kevin. Maybe not the cheapest but robust. Can't remember what resitance I used - I'll check when I have a moment and let you know. Just drill a hole and push them in. Kevin, for panels, I guess modelers use whatever they want - I use 3mm & 5mm LEDs - with just a hole to fit them in & apply some PVA on the back to make sure they stay in position - easy to get out if needed. Here's a copuple of shots of my small mimic panel Kevin. 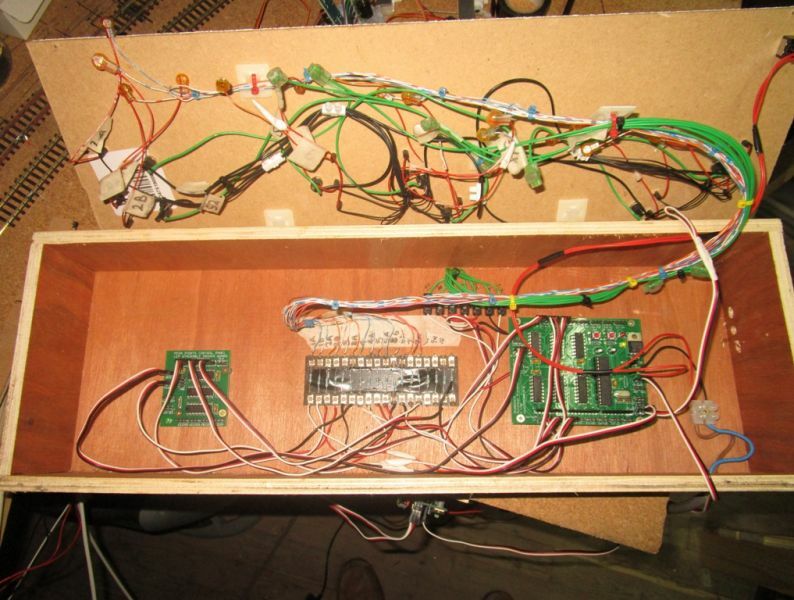 It controls 10 servo motors - enough, as you can see, for 4 route changing points (Nos 1; 2; 5 & 7) and 6 others (Nos 3; 4 & 6 each controlling 2 points) associated with the 3 crossovers - via a "Megapoints" controller (http://megapointscontrollers.com/megapoints). The green LEDs show which route is set. When I press the red button, the 2 LEDs flash alternately then, once the point position has changed, only the corresponding LED is alight. This is what's inside - not a pretty sight but it works well. Not much wrong with that, Peter. Not very professional looking but I'm happy with it - and, more importantly, it works. OK, Petermac, what is with the flashing LEDs then ? Can't the system makes its mind up? It flashes while the throw bar moves across, Sol. Sol wrote: OK, Petermac, what is with the flashing LEDs then ? Can't the system makes its mind up? Hi Petermac. Bravo, Bravo it looks fine to me, Alas I cannot follow your fine example with my manual points, and I was never one for modernisation , a bit of a Luddite ? But I do admire your system. And safety must come first.would you please tell me about the power consumption of the LED's and would I be able to " do my own thing"? By making aPluggable Mimic board? Connected to the DPDT slide switches that are doing the job of point Motors . 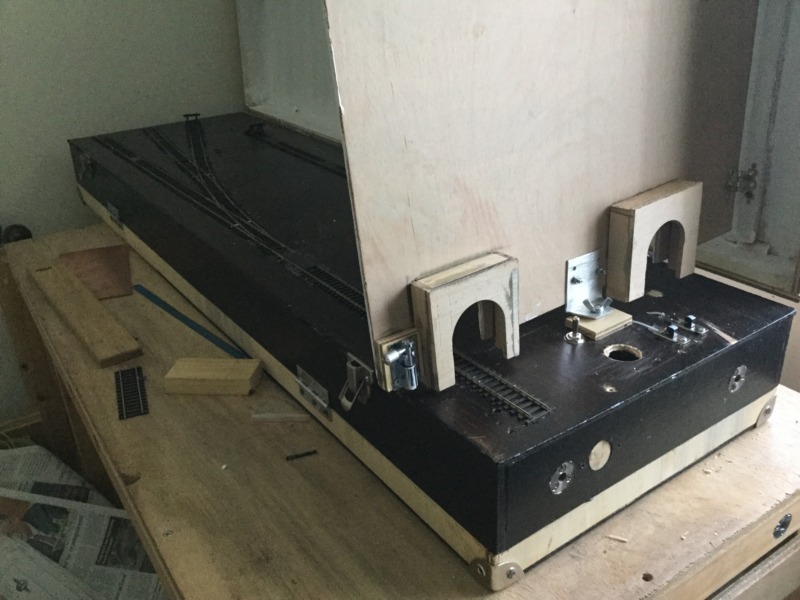 My rough plan is using the spare terminals on the switches with a power supply, resistors, and suitable LED's, with either built in sockets on or under the baseboard ( of course they would have to be hidden,from view) but which connectors are best ? I have a plan for the panel , it looks just like your one, only compact . LEDs consume almost no power Kevin - mine are 12 volts but only use milliamps of power. My panel has a dedicated 12v regulated supply but that's because the Mega Points controller requires a steady supply. For LEDs, any old supply will do but the resistor is critical otherwise they'll blow instantly. I see no reason why you can't use your DPDT switches with an LED wired to them via the resistor. My panel mounted LEDs came with a "normal" wire attached (plain LEDs usually have 2 plain wire "legs" for connections). Having wires already attached, they could be connected to the "circuit" either by soldering, choc blocks or in fact, any kind of connector you care to use. It's just like connecting any wire to another - do it how you choose to. Naturally the panel mounted LEDs are more expensive that the plain ones but they are very robust. I'll post a photo of one later so you can see what you're paying for. Hi Max I have hit a snag ( not a sausage ) with my mimic panel, "interconnectivity?" I have cobbled together my panel, purchased the LED's, 15 pin plug and socket (but I am only using nine pins) all ready and waiting, but, I cannot find a suitable "9 Core cable" for a tidy connection between the baseboard and panel, I have looked on eBay without any luck, I know there are many experts on YMRC, but I remember your thread on baseboard wiring. I thought of nine different coloured wires and binding them with cable ties, or heat shrink tubing but that may not be satisfactory ? Have you got any good ideas or know where I am able to make such a purchase , as I only require about a yard (or a metre), all the adverts that I have seen quote one hundred metres or more. Kevin, most electronic shops sell it by the yard/metre but you have to go there. For applications like this, I use rainbow cable. Available at your local electronics store. Yes. It's easily separated as described on Google. It solders well and will easily carry LED current. I've even used it for CDU's. If you're soldering a gang of nine wires to the device, each will support the others. If I've stripped them apart, I will usually put a cable tie around them for support. Hi Petermac. My very basic manual mimic panel has been a long time coming? Now that is just about ready.But to improve it? I went to my local Maplin branch and purchased a VGA 1.5 Extension Cable, Male to Female (as opposed to my original idea of one end being wired to the panel and the other end flying loose with a plug on it). But it didn't work, Why? Hi Petermac Over the weekend? and a bit more? I have purchased a piece of clear plastic, drilled the holes for the LED’s, put masking tape. for my track plan, and sprayed with a rattle can a grey primer ( Halfords ) meant for plastic . Now I have removed the tape it looks too clear? And I intend painting over the grey primer with a translucent orange colour? ( do you think that this is a good choice of paint ?) to represent the Panel used in a signal cabin with one difference, it will not show train passage.The old Mimic Panel worked ( manual ) no flashing lights) but I wanted to update the “ plain wooden box” . I just went to IKEA and bought a couple of standard lamps and mounted both booms on the one mast.